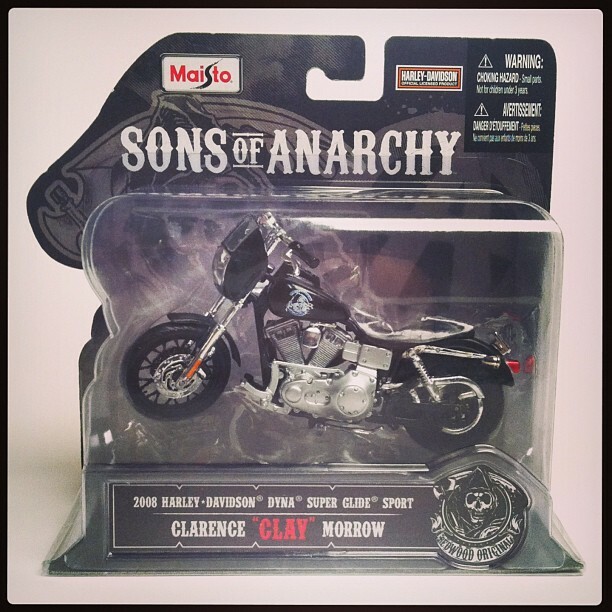 There is now the Sons Of Anarchy collection of die-cast motorcycles. Back in December, Maisto announced they worked closely with 20th Century Fox and Harley-Davidson to bring fans of the show 1:18 scale die-cast versions of the SOA motorcycles in association with the TV show characters: Jax, Clay, Opie and JT – the SOA Motorcycle Collection. Not only can you now dress and ride like SOA outlaws, thanks to a flurry of licensing deals that includes everything from actual motorcycles at Bartel’s H-D to hats, games, stationary, jewelry, calendars, stickers, wall graphics and more. Now while sitting in your work cube thinking about the winter cold you can have your very own die-cast outlaw motorcycle to stare at and think about how you can’t wait to ride in warmer weather! The Maisto brand name was registered in 1990 by May Cheong, a vertically integrated manufacturer based in Hong Kong. The company has been manufacturing die cast replicas for over 40 years. They have over 11,000 employees worldwide, and manufacturing facilities covering more than 2 Million square feet. 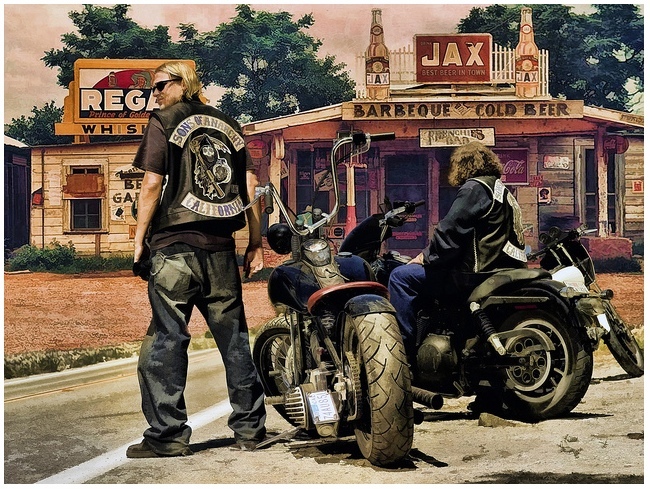 Sons Of Anarchy merchandise sales have grown 70% year-to-year since 2010. This is not a U.S. only concept as the TV show is a hit in U.K., Australia, New Zealand, Germany and the Netherlands. And with the TV show committed through a seventh season merchandise sales will only increase. Previous SOA/H-D license deals blog post HERE. Photo courtesy of Maisto, 20th Century Fox and Harley-Davidson. I called this back in 2009 with a post called Bottling Ideas. UPDATE: Actually now that I’ve re-scanned the blog it was even earlier with a post in 2008 called Harley SAMCRO Limited Edition Motorcycle HERE. I was flipping TV channels last night and landed on FX during a commercial. Nothing so special about that… WAIT… they’re advertising a Sons of Anarchy custom Harley-Davidson FXD Dyna Superglide motorcycle with a Custom Reaper paint job! THAT… idea seems very familiar. Sure enough, I blogged last year about how H-D marketing ought to consider developing a SAMCRO Limited Edition motorcycle and now they are doing it. I don’t know if Eagle’s Nest Harley-Davidson (13900 Harlan Road, Lathrop, CA) saw the post and acted on my idea, but they indeed developed a promotional giveaway campaign with the SOA producers and created a unique branding tie in to the television show. In my view, that’s creative marketing! Or rather its good strategic co-branding/partnering with the right ingredients that make sense for the manufacturer and producer. Kudo’s H-D! Before you haters get tripped up on this idea and launch a barrage of poser comments… Let’s maintain perspective here as the “Reaper” bike is like co-branding NASCAR merchandise. It’s an “ingredient brand” motorcycle that will appeal to enthusiasts who like and/or identify with the show. Think about the Indianapolis 500 and the Indy 500 themed or co-branded pace cars with GM. Just because you wear a race t-shirt and drive a 1989 Pontiac Trans-Am Pace Car does not make you an Indy 500 race car driver! I’m sure anyone who rides the “Reaper Bike” knows who they are and what they are about and wouldn’t pass themselves off as a club affiliated biker. Photo courtesy of SOA web site.